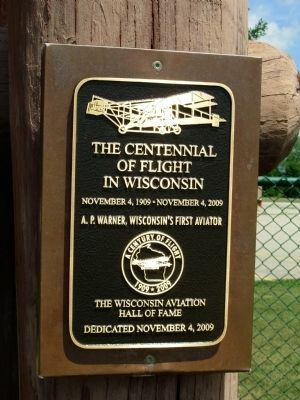 The nation’s first commercially built “aeroplane” was assembled and flown here November 4, 1909, by Arthur P. Warner, Wisconsin’s first pilot. Self-taught, Warner was the 11th American to pilot a powered aircraft and first in the U.S. to buy an aircraft for business use. Built by Glenn H. Curtiss, the biplane was “sister” to the aircraft in which Curtiss won the Bennett trophy race in Rheims, France, August 29, 1909. Inventor and manufacturer, Warner used the aircraft in research and to publicize his automotive products. He developed the automobile speedometer, automotive and machine tool accessories, and built the first electric power plant in Beloit. 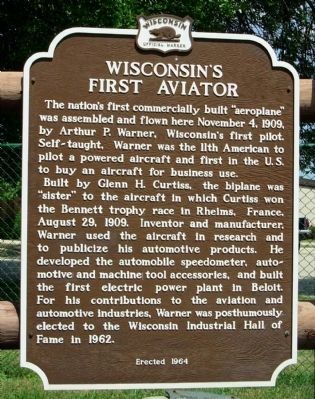 For his contributions to the aviation and automotive industries, Warner was posthumously elected to the Wisconsin Industrial Hall of Fame in 1962. 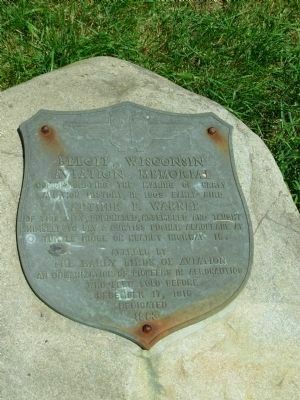 88° 59.427′ W. Marker is in Beloit, Wisconsin, in Rock County. Marker is at the intersection of Milwaukee Road (State Highway 81) and Lee Lane, on the right when traveling west on Milwaukee Road. Touch for map. 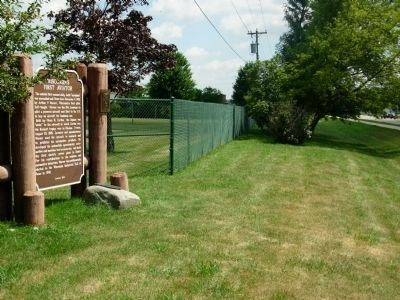 Marker is in this post office area: Beloit WI 53511, United States of America. Touch for directions. Other nearby markers. At least 8 other markers are within 5 miles of this marker, measured as the crow flies. Black Hawk War (approx. 1.2 miles away); The Medal of Honor (approx. 1.2 miles away); Roy Chapman Andrews (approx. 2.3 miles away); Beloit College (approx. 2.4 miles away); Rasey House (approx. 2½ miles away); Black Hawk at Turtle Village / The U.S. Military at Turtle Village (approx. 2.7 miles away); Abraham Lincoln (approx. 2.8 miles away); Home of Governor Harvey (approx. 4.3 miles away). Touch for a list and map of all markers in Beloit. Looking northeast from corner of Milwaukee Road and Lee Lane. Small marker on right post. More. 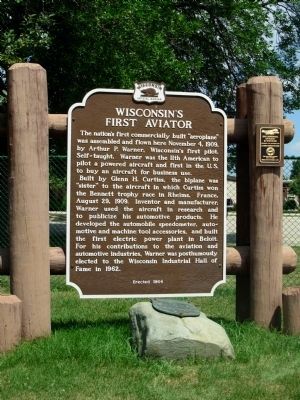 Search the internet for Wisconsin's First Aviator. Credits. This page was last revised on June 16, 2016. This page originally submitted on May 13, 2011, by Paul Fehrenbach of Germantown, Wisconsin. This page has been viewed 627 times since then and 21 times this year. Last updated on May 13, 2011, by Paul Fehrenbach of Germantown, Wisconsin. Photos: 1, 2, 3, 4, 5. submitted on May 13, 2011, by Paul Fehrenbach of Germantown, Wisconsin. • Bernard Fisher was the editor who published this page.